All of Me at The Vaults. Photo: The Other Richard. The stage is ramshackle, full of cardboard boxes stacked haphazardly around that provide an insight into Gareth’s (Jack Wilkinson) unorganised, potentially unhinged mind. But he hangs onto the things that are important – he knows how to make his ex-boss Derrick the perfect cup of tea with the correct biscuits to match his every mood. Unfortunately that attention to detail wasn’t enough, and despite being the self-proclaimed best travel agent in the business, Gareth was fired. It all seems so unfair. Martin Brett’s All Of Me opens on a despairing young man. It’s apparent that Gareth is struggling. He wears a corduroy jacket, dishevelled and haggard; the bags under his eyes indicate he doesn’t sleep well; he lives with his mum when he definitely should have moved out. In this way Nicola Ralph’s set serves up multiple allegories, in this case a jibe at Gareth’s living situation. Even the boxes are telling him to grow up, get a grip and move on with his life. Wilkinson himself takes on a number of telling nervous ticks – his eyes dart about, constantly blinking as if trying not to reveal a hidden secret. His persona is jumpy and jagged. He’s constantly on the move like a man who’s popped a handful of uppers and physically can’t keep still. The performance stays on this plane throughout the short show, a 40-minute rant from a man that descends into the realms a paranoid breakdown. Brett’s script gives us some insight into the central character’s background – moments of tenderness that director Liz Bacon could extract to greater effect when Gareth speaks of his dad. It’s clear that the loss of a male role model is the beginning of the end for Gareth, a figure that he idolised as child to such a degree that he developed a complex in his presence. So terrified of disappointing his father, Wilkinson speaks of the man in reverent, hushed tones. That initial relationship is clearly transferred to ex-boss Derrick, giving Gareth a delusional position of power in the workplace. He believes he is the golden boy, the teacher’s pet, and is blind to all the mistakes he is making. 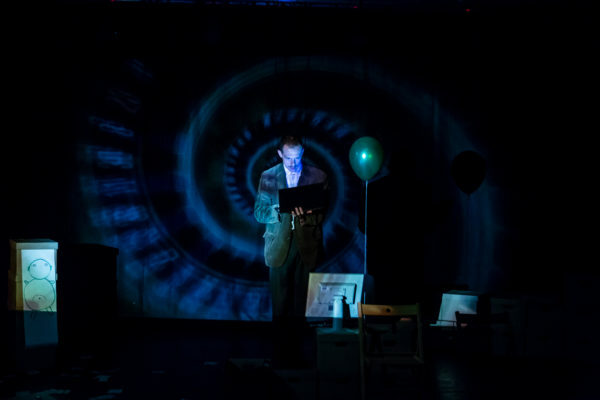 As he destroys the set at the end of the show we see gambling chips and unpaid bookies tickets strewn across the stage, as the truth of his addiction unwittingly unmasks itself. As a short story, All of Me suitably unwinds itself and showcases a man at the end of his tether. But in order to generate empathy, to win over the audience and not simply come across as deluded, deranged and deadly, Brett’s script would benefit from some more background. Whether in flashbacks to his upbringing, or snippets of his work persona, there is a wealth of potential in further unpicking the already fragile central character. All of Me is on until 5th March at Vaults festival 2017. Click here for more details.